I found something awesome this afternoon. A client with an active blog (about 130 posts) moved her content from an old, separate WordPress blog to a new site with the blog integrated. That meant we exported content from the old site and imported it from the XML file to the new one – and typically, none of the images came with the import. So what we wound up with on the new site is 100-some blog posts where the images were not in the media library, but linked to the old blog. That is a pain, but to be expected. As you can imagine she was not looking forward to manually downloading all those images and manually adding them to each post; moving WordPress blog images can be a big pain. But I found this amazing plugin today: Import External Images. How does it work, you say? I’ll tell you! Install the plugin as usual. Then go through your blog posts one by one looking at the editor page for each (yes I know that’s a pain, but this is far, far better than the alternative. Trust me). In the right sidebar you’ll see this new panel that will tell you if you have any images in the post that can be imported, and how many. It looks for images that are linked externally to other sites. 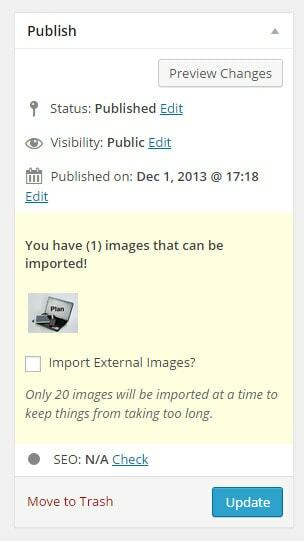 All you need to do is tick the checkbox for Import External Images and click Update. When you do that, the plugin makes a copy of the linked image(s) and puts that copy in the Media Library.